La Jolla, California 92093-0444, U.S.A.
Air samples at Mauna Loa are collected continuously from air intakes at the top of four 7-m towers and one 27-m tower. Four air samples are collected each hour for the purpose of determining the CO2 concentration. Determinations of CO2 are made by using a Siemens Ultramat 3 nondispersive infrared gas analyzer with a water vapor freeze trap. This analyzer registers the concentration of CO2 in a stream of air flowing at ~0.5 L/min. Every 30 minutes, the flow is replaced by a stream of calibrating gas or "working reference gas". In December 1983, CO2-in-N2 calibration gases were replaced with the currently used CO2-in-air calibration gases. These calibration gases and other reference gases are compared periodically to determine the instrument sensitivity and to check for possible contamination in the air-handling system. These reference gases are themselves calibrated against specific standard gases whose CO2 concentrations are determined manometrically. Greater details about the sampling methods at Mauna Loa are given in Keeling et al. (1982) and Keeling et al. (2002). Hourly averages of atmospheric CO2 concentration, wind speed, and wind direction are plotted as a basis for selecting data for further processing. Data are selected for periods of steady hourly data to within ~0.5 parts per million by volume (ppmv); at least six consecutive hours of steady data are required to form a daily average. Greater details about the data selection criteria used at Mauna Loa are given in Bacastow et al. (1985). Data are in terms of the Scripps "03A" calibration scale. The Mauna Loa atmospheric CO2 measurements constitute the longest continuous record of atmospheric CO2 concentrations available in the world. The Mauna Loa site is considered one of the most favorable locations for measuring undisturbed air because possible local influences of vegetation or human activities on atmospheric CO2 concentrations are minimal and any influences from volcanic vents may be excluded from the records. The methods and equipment used to obtain these measurements have remained essentially unchanged during the 51-year monitoring program. Bacastow, R.B. 1979. Dip in the atmospheric CO2 level during the mid-1960's. Journal of Geophysical Research 80:3109-14. Bacastow, R.B., and C.D. Keeling. 1981. Atmospheric carbon dioxide concentration and the observed airborne fraction. In B. Bolin (ed. ), Carbon Cycle Modelling, SCOPE 16. John Wiley and Sons, New York. Bacastow, R.B., J.A. Adams, Jr., C.D. Keeling, D.J. Moss, T.P. Whorf, and C.S. Wong. 1980. Atmospheric carbon dioxide, the Southern Oscillation, and the weak 1975 El Niño. Science 210:66-68. Bacastow, R.B., C.D. Keeling, and T.P. Whorf. 1985. Seasonal amplitude increase in atmospheric CO2 concentration at Mauna Loa, Hawaii, 1959-1982. Journal of Geophysical Research 90(D6):10529-40. Keeling, C.D. 1960. The concentration and isotopic abundance of carbon dioxide in the atmosphere. Tellus 12:200-203. Keeling, C.D. 1984. Atmospheric and oceanographic measurements needed for establishment of a data base for carbon dioxide from fossil fuels. In The Potential Effects of Carbon Dioxide-Induced Climatic Changes in Alaska. (Miscellaneous, etc.). The Proceedings of a Conference. Fairbanks, Alaska, April 7-8, 1982. School of Agriculture and Land Resources Management, University of Alaska, Fairbanks. Keeling, C.D. 1998. Rewards and penalties of monitoring the earth. Annual Review of Energy and the Environment 23:25-82. Annual Reviews Inc., Palo Alto. Keeling, C.D., R.B. Bacastow, A.E. Bainbridge, C.A. Ekdahl, Jr., P.R. Guenther, L.S. Waterman, and J.F.S. Chin. 1976. Atmospheric carbon dioxide variations at Mauna Loa Observatory, Hawaii. Tellus 28(6):538-51. Keeling, C.D., R.B. Bacastow, and T.P. Whorf. 1982. Measurements of the concentration of carbon dioxide at Mauna Loa Observatory, Hawaii. In W.C. Clark (ed. ), Carbon Dioxide Review: 1982. Oxford University Press, New York. Keeling, C.D., R.B. Bacastow, A.F. Carter, S.C. Piper, T.P. Whorf, M. Heimann, W.G. Mook, and H. Roeloffzen. 1989. A three-dimensional model of atmospheric CO2 transport based on observed winds: 1. Analysis of observational data. In D.H. Peterson (ed. ), Aspects of Climate Variability in the Pacific and the Western Americas. Geophysical Monograph 55:165-235. Keeling, C.D., J.F.S. Chin, and T.P. Whorf. 1996. Increased activity of northern vegetation inferred from atmospheric CO2 measurements. Nature 382: (6587) 146-49. MacMillan Magazines Ltd., London. Keeling, C.D., T.P. Whorf, M. Wahlen, and J. van der Plicht. 1995. Interannual extremes in the rate of rise of atmospheric carbon dioxide since 1980. Nature 375:666-670. Keeling, C.D., P.R. Guenther, G. Emanuele III, A. Bollenbacher, and D.J. Moss. 2002. 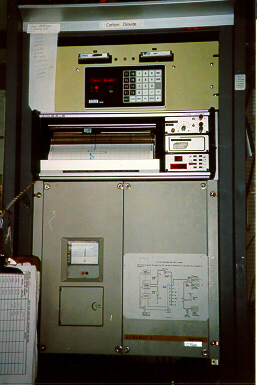 Scripps Reference Gas Calibration System for Carbon Dioxide-in-Nitrogen and Carbon Dioxide-in-Air Standards: Revision of 1999 (with Addendum). SIO Reference Series No. 01-11. Keeling, C.D., S.C. Piper, R.B. Bacastow, M. Wahlen, T.P. Whorf, M. Heimann, and H.A. Meijer. 2005. Atmospheric CO2 and 13CO2 exchange with the terrestrial biosphere and oceans from 1978 to 2000: observations and carbon cycle implications. In J.R. Ehleringer, T.E. Cerling, and M.D. Dearing (eds. ), A History of Atmospheric CO2 and its effects on Plants, Animals, and Ecosystems, pages 83-113, Springer Verlag, New York. Pales, J.C., and C.D. Keeling. 1965. The concentration of atmospheric carbon dioxide in Hawaii. Journal of Geophysical Research 24:6053-76. Whorf, T.P., and C.D. Keeling. 1998. Rising carbon. New Scientist 157:(2124) 54-54. New Scientist Publ Expediting Inc., Elmont.